Ontario Hydro operates 2 Hydro Generating Stations in Niagara Falls, they are Sir Adam Beck Plant #1 & Plant #2 located along the Niagara Parkway. The Robert Moses Hydro Electric Plant is located in Niagara County of Western New York State between Niagara Falls, New York and Lewiston, New York. The Sir Adam Beck Generating Stations and the Robert Moses Generating Station are built directly opposite each other. Both Generating Stations are joined to each others electrical grid system by high voltage transmission lines. Between the base of the Horseshoe Falls and the Whirlpool the water elevation drops approximately 22 metres. From November to April, the water in the river below the Falls does not fluctuate substantially and during this period water diversion for hydro electric generation is at its maximum. At night, when Hydro Control Dam gates are lifted for diversion of Niagara River water into the hydro tunnels, the flow over the Horseshoe Falls drops to a minimum 15,240 cubic metres of water per second. By the International Agreement, the Canadian power stations draw 56,500 cubic feet of water per second and the American power stations draw 32,500 cubic feet of water per second. The Sir Adam Beck Generating Stations and the Robert Moses Generating Station together form the largest generators of hydro electric power in North America. 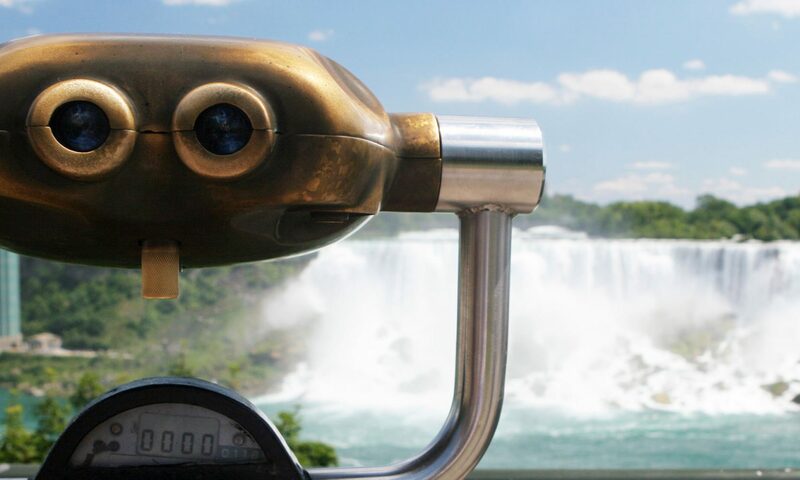 Flow rates of water are monitored by Ontario Hydro through sensing devices on both the Rainbow International Bridge and the Whirlpool International Bridge. The Ontario Hydro water intake gates for water diversion are located 2.6 km upstream from the Horseshoe Falls. The International Control Dam operated by Ontario Hydro and the New York State Power Authority is located 2.6 km upstream from the Falls. Approximately 18 gates are raised or lowered in order control the water flow over the Falls for diversion into the Hydro Tunnels of Ontario Hydro and the New York State Power Authority. The dam extends 670m to the International boundary. Ontario Hydro has two water tunnels which traverse the entire City of Niagara Falls from the Village of Chippawa in the South to the Sir Adam Beck Hydro Electric Generating Stations in the North. Also they are in the process of building the third tunnel. In addition, Ontario Hydro has a 13.6 km open canal which traverses the entire City of Niagara Falls. Ontario Hydro has a 750 acre water reservoir above the Sir Adam Beck plants. At night, water is pumped into this reservoir which acts as a backup system. During the day, Ontario Hydro draws water from the reservoir to fill the water gap in order that the generators run at optimum capacity. The Robert Moses Hydro Electric Generating Plant has two buried water intakes, which are located upstream of the Falls. Both conduits are parallel to each other and are 30 m deep and 121 m wide. The now retired Ontario Power Company was located at the base of the Horseshoe Falls. It consisted of 10 generators and had a total power output capacity of 100,000 horsepower. In 1999, Ontario Hydro underwent a major restructuring. The company was divided into two sections: The Ontario Power Generation Company and the Ontario Power Distribution Company. At the current time, both New York State Power Authority – Niagara Project and Sir Adam Beck Power Group continue to refit generators with plans to increase efficiency and power generation capacity. Ontario Power Generation has reached its maximum diversion capacity.